London Philharmonic Orchestra will be held at NCPA - Concert Hall on March 14, 2019. Vladimir Jurowski was appointed Principal Guest Conductor of the London Philharmonic Orchestra in 2003, becoming Principal Conductor in 2007. Last season they celebrated the tenth anniversary of this extraordinary partnership. One of today’s most sought-after conductors, acclaimed worldwide for his incisive musicianship and adventurous artistic commitment, Vladimir Jurowski was born in Moscow and studied at the Music Academies of Dresden and Berlin. In 1995 he made his international debut at the Wexford Festival conducting Rimsky-Korsakov’s May Night, and the same year saw his debut at the Royal Opera House, Covent Garden, with Nabucco. In 2021 Vladimir will take up the position of Music Director at the Bayerische Staatsoper in Munich. In 2017 he became Chief Conductor and Artistic Director of the Berlin Radio Symphony Orchestra. In addition, he holds the titles of Principal Artist of the Orchestra of the Age of Enlightenment, Artistic Director of the Russian State Academic Symphony Orchestra and Artistic Director of the George Enescu International Festival, Bucharest. He has previously held the positions of First Kapellmeister of the Komische Oper Berlin (1997–2001), Principal Guest Conductor of the Teatro Comunale di Bologna (2000–03), Principal Guest Conductor of the Russian National Orchestra (2005–09), and Music Director of Glyndebourne Festival Opera (2001–13). Vladimir is a regular guest with many leading orchestras in both Europe and North America, including the Royal Concertgebouw Orchestra, the Accademia Nazionale di Santa Cecilia, the New York Philharmonic, The Philadelphia Orchestra, The Cleveland Orchestra, the Boston, San Francisco and Chicago symphony orchestras, and the Tonhalle-Orchester Zürich, Leipzig Gewandhausorchester, Mahler Chamber Orchestra, Staatskapelle Dresden and Chamber Orchestra of Europe. His opera engagements have included Rigoletto, Jenůfa, The Queen of Spades, Hansel and Gretel and Die Frau ohne Schatten at the Metropolitan Opera, Parsifal and Wozzeck at Welsh National Opera; War and Peace at the Opéra National de Paris; Eugene Onegin at the Teatro alla Scala, Ruslan and Ludmila at the Bolshoi Theatre; Salome with the State Academic Symphony of Russia, Moses und Aron at the Komische Oper Berlin, Iolanta and Die Teufel von Loudun at Semperoper Dresden, and numerous operas at Glyndebourne including Otello, Macbeth, Falstaff, Tristan und Isolde, Don Giovanni, The Cunning Little Vixen, Peter Eötvös’s Love and Other Demons, and Ariadne auf Naxos. In 2017, he made an acclaimed Salzburg Festival debut with Wozzeck and his first return to Glyndebourne as a guest conductor, in the world premiere production of Brett Dean’s Hamlet with the LPO. The London Philharmonic Orchestra has released a wide selection of Vladimir Jurowski’s live recordings with the Orchestra on its own label, including Brahms’s complete symphonies, Mahler’s Symphonies Nos. 1 and 2, and Rachmaninoff’s Symphony No. 3 and Symphonic Dances. Autumn 2017 saw the release of a seven-disc set of Tchaikovsky’s complete symphonies under Jurowski (LPO-0101), and a special anniversary seven-disc set of his previously unreleased recordings with the LPO spanning the symphonic, choral and contemporary genres (LPO-1010). One of the world´s leading violinists, Julia Fischer is a versatile musician also known for her extraordinary abilities as a concert pianist, a chamber musician and a violin teacher. Born in Munich to German-Slovakian parents, Julia received her first violin lessons at the age of three and her first piano lessons shortly after from her mother Viera Fischer. At the age of nine, she started studying with the renowned violin professor Ana Chumachenco, later becoming her successor. The first prize at the international Yehudi Menuhin Competition in 1995 was one of the milestones in her early career and she has since performed with top orchestras worldwide frequently, working with renowned conductors such as Herbert Blomstedt, Riccardo Muti, Esa-Pekka Salonen, Yuri Temirkanov and Franz Welser-Möst. Julia Fischer started the 2018/19 seasons touring Europe with her long-time chamber music partners Nils Mönkemeyer and Daniel Müller-Schott. She then embarked on a tour of Asia with the London Philharmonic Orchestra and Vladimir Jurowski, performing in Seoul, Taipei, Beijing and Shanghai as well as with the Dresden Philharmonic and Michael Sanderling performing in Japan and Korea. She is joined by violinist Augustin Hadelich for an extensive tour of Germany with the Academy of St. Martin in the Fields, an orchestra she frequently collaborates with. Highlights of the past season included concerts with the Bayerisches Staatsorchester under Kirill Petrenko at the Elbphilharmonie in Hamburg and New York’s Carnegie Hall and a residency with the Vienna Symphony Orchestra and Philippe Jordan. In 2011 Julia Fischer founded her own Quartet with Alexander Sitkovetsky, Nils Mönkemeyer and Benjamin Nyffenegger and continues to tour extensively in this formation. Her concert at the Alte Oper Frankfurt in 2010 marked her debut as a pianist: She performed the Grieg's Piano Concerto in the second half of the concert, having played Saint-Saëns’s Violin Concerto No. 3 in the first half. The performance is available on a Decca-released DVD. Teaching is another integral part of her musical life as she continues to nurture and guide young talent. In February 2019, she will perform together with her students Eva Zavaro and Louis Vandory with the Kammerakademie Potsdam at the Berlin Philharmonie. She regularly gives masterclasses at Musikferien at Lake Starnberg (Starnberger See). Over the course of her artistic career, Julia Fischer has released numerous critically acclaimed and awarded CD and DVD recordings, first under the Pentatone label and later under Decca. Breaking new ground in the classical music market, she has recently launched her own music platform, the JF CLUB, which offers exclusive audio and video footage, previews of her new recordings as well as personal insight into music and her work. The six solo sonatas by Eugène Ysaye, César Franck’s Sonata in A Major and Karol Szymanowski’s Sonata in D Minor are all available exclusively on JF CLUB. Julia Fischer holds numerous awards including the Federal Cross of Merit, Gramophone Award and the German Culture Prize. She plays a violin by Giovanni Battista Guadagnini (1742) as well as an instrument made by Phillipp Augustin (2018). One of the finest orchestras on the international stage, the London Philharmonic Orchestra balances a long and distinguished history with its reputation as one of the UK’s most forward-looking ensembles. As well as its concert performances, the Orchestra also records film soundtracks, releases CDs on its own record label, and reaches thousands of people every year through activities for families, schools and community groups. The London Philharmonic Orchestra has been performing at Southbank Centre’s Royal Festival Hall since it opened in 1951, becoming Resident Orchestra in 1992. It also has flourishing residencies in Brighton and Eastbourne, and in summer plays for Glyndebourne Festival Opera where it has been Resident Symphony Orchestra for over 50 years. Touring abroad forms a significant part of the Orchestra’s schedule: highlights of the 2018/19 season include a major tour of Asia including South Korea, China, as well as performances in Belgium, France, Germany, The Netherlands, Spain, Greece, Switzerland and the USA. 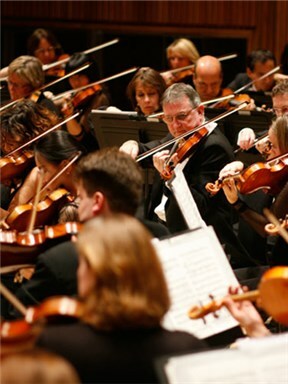 The London Philharmonic Orchestra broadcasts regularly on television and radio. It also works with the Hollywood and UK film industries, recording soundtracks for blockbusters including the Oscar-winning score for The Lord of the Rings trilogy. In 2005 it established its own record label. The London Philharmonic Orchestra maintains an energetic Education & Community programme including the BrightSparks schools’ concerts and FUNharmonics family concerts. Its work at the forefront of digital engagement and social media has enabled the Orchestra to reach even more people worldwide: all its recordings are available to download from iTunes and, as well as a YouTube channel and regular podcasts, the Orchestra has a lively presence on social media.